It feels like only yesterday that Miss Saigon was preparing for a West End revival, but it's been over a year since Boublil and Schoenberg's ever popular epic closed in London. Happily though, it is touring the UK and Ireland again, and leaving a string of teary eyes behind it wherever it goes. Set during the Vietnam war and in the years of uncertainty that followed, Miss Saigon tells the story of a doomed romance between Kim, a 17 year old bar girl, and Chris, an American GI, and explores ideas about tradition, survival, and love in many different forms. Inspired by Puccini's Madame Butterfly, Miss Saigon is a timeless story with haunting songs and an unforgettable story, and has captured the hearts of audiences around the world since it was first seen on the West End back in 1989. Fans and newbies can rest assured that this touring production absolutely matches up to the titanic scale of the recent West end iteration. Its hugely detailed set is so incredibly intricate that the world of the story feels totally realised, and Miss Saigon's famously scene stealing set pieces are as awe inspiring as ever! Additionally its monumental scale is bolstered by an impressively large cast, which fills the stage with bustling life and amplifies every ensemble number. The cast shines in songs like Bui Doi, and This Is The Hour, where their talent is palpable. What is Miss Saigon, though, without a superstar Kim? Like a beacon of light, Sooha Kim is totally transcendent in the role. With a sweet yet powerful voice, and a characterisation of the role which is full of innocence and love, her performance is beautifully nuanced and immensely touching. She carries the show with ease and has the audience on her side from the first moment she steps on stage. Having understudied the role in the West End revival before taking on the lead full time in a more recent production in Japan, it's clear that Kim is a character which Sooha Kim is connected to deeply. Her revelatory performance sticks in the mind long after the curtain comes down. Opposite Sooha Kim, Ashley Gilmour makes a perfectly dashing Chris. An American GI with a conscious, Chris is potentially a difficult character to pitch, but Gilmour does well to make Chris sympathetic and truthful on stage. And of course, the two leads make an utterly gorgeous couple, with strong chemistry and voices which blend together perfectly. 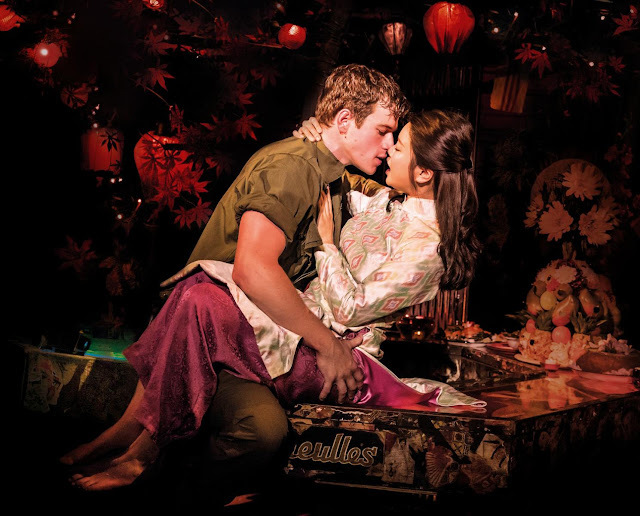 The are so many unforgettable songs in Miss Saigon, and the several love duets between the musical's central couple are no exception. Most notable perhaps, is Last Night Of The World, a song so full of dramatic irony, and featuring such a stirring melody, it makes the rushed romance between Kim and Chris seem totally believable. However, it is I'd Give My Life For You, Kim's formidable act one closing number, which steals the show. Kim and Chris' love may be powerful, but it's motherly love which dominates the latter half of the Miss Saigon and nowhere is that more evident than in Kim's foreboding solo. It's not every day that a touring production of this calibre comes around, and if you've not yet crossed Miss Saigon of your to-see list then there has never been a better opportunity. Miss Saigon is touring around the UK and Ireland until late 2018. Catch it at your local theatre or miss out!